Red Roses combined with White AsiaticLilies, makes this bouquet an absolutelystunning gift, for when you want to impresshugely and make everyone's dream cometrue.Lilies may be sent closed/partially closed inorder to prevent damage and to last longer.Vase not included however to betterpersonalise your gift, we recommend addinga Standard Vase to accompany this lovelycombination. The flowers ordered in England for our daughter and son-in-law's anniversary arrived on time and were beautiful. Thank you. The flowers were nicely delivered at a good time. My boyfriend was really surprised! However I had ordered red roses and white lillies, but he got orange lillies instead. 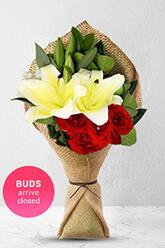 Which is ok, they were also nice, I just think the white lillies would have been more romantic with the red roses. Thank you so much for for 2 reason: 1) my special someone gets a real surprise and I'm happy and grateful for that; 2) the flowers where delivered early during the day. Until next time again. Beautiful floral arrangements was very hard to pick just one. Especially with such a variety wnd great prices.